Home air Force Officer DESW Navy Officer Revision of Pension/Family Pension to Major Generals and equivalent ranks of Navy and Air Force who retired/died prior to 01.01.2006. Subject: Implementation of Hon’ble AFT Chandigarh order dated 04.03.2010 passed in CA No. 100/2010 filed by SPS Vains (Retd.) & 52 Others. The undersigned is directed to refer to Govt. of India, MoD, Deptt. of Ex- Servicemen Welfare’s letter No. 4(140)2010/ D(Pen/ Legal) Vol. III dated 10.08.2015 issued for implementation of Hon'ble Armed Forces Tribunal, Chandigarh’s order dated 04.03.2010 directing respondents to implement the decision of the Hon'ble Supreme Court dated 09.09.2008 rendered in SLP (Civil) No. 12357 of 2006 [Union of India Vs SPS Vains (Retd.) and 52 others] in the matter of fixation of pension of the pre-2006 retiree petitioners. 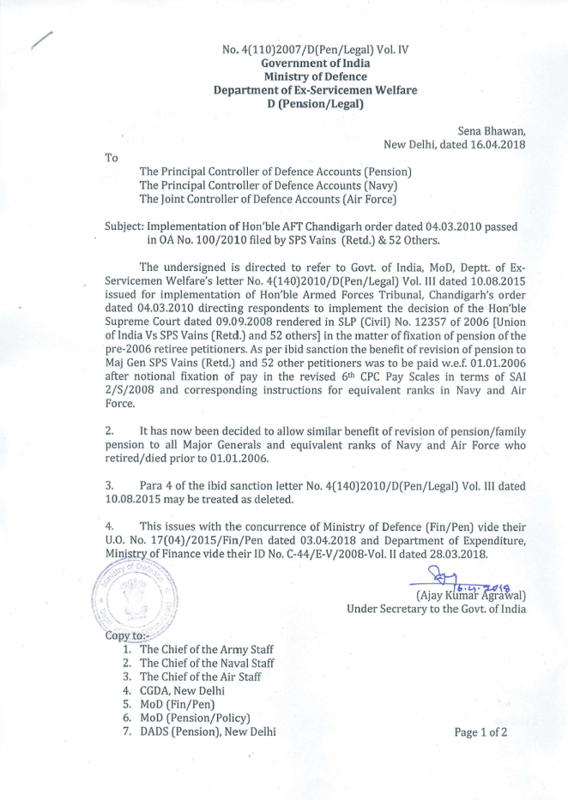 As per ibid sanction the benefit of revision of pension to Maj Gen SPS Vains (Retd.) and 52 other petitioners was to be paid w.e.f. 01.01.2006 after notional fixation of pay in the revised 6th CPC Pay Scales in terms of Sal 2 /S/ 2008 and corresponding instructions for equivalent ranks in Navy and Air Force. 2. It has now been decided to allow similar benefit of revision of pension /family pension to all Major Generals and equivalent ranks of Navy and Air Force who retired/died prior to 01.01.2016. 3. Para 4 of the ibid sanction letter No. 4(140)2010 / D (Pen/ Legal) Vol. III dated 10.08.2015 may be treated as deleted. 4. This issues with the concurrence of Ministry of Defence (Fin/ Pen) vide their U.O. No. 17(04)/2015/Fin/Pen dated 03.04.2018 and Department of Expenditure, Ministry of Finance vide their ID No. C-44/E-V/2008-Vol.II dated 28.03.2018.